Many businesses often struggle with their credit control processes. In fact “according to Bacs, 60% of SMEs have experienced late payments with the average company waiting for £38,186 in overdue payments.” So we thought we would share with you some of the most frequently asked questions about credit control and debt collection. Q: Why do customers pay late? Q: How do I know if I can give a customer credit? A: The best way of knowing if a customer is credit worthy is to run a credit check on them. This will provide you with a credit score, history of CCJ’s if any, financial reports, a proposed credit limit and more. You may even be able to verify their address and address history. You can then base your credit limit and payment terms on the credit report. Some industries are a higher risk then others, meaning that they pay much later than others and are more at risk of going into administration, liquidation or bankruptcy. Q: What can I do if a payment is late and there isn’t a genuine reason for not paying? A: Send a politely worded letter to your customer when the debt is on average 7 days overdue. Although some creditors send a letter when a payment due is just one day overdue, others may wait 10 days. You can also give them a call to ascertain why the payment is late before sending a letter. Formalising a call with a letter is paramount in the successful credit control process if the debt is submitted to court. Q: How can I obtain the payment without upsetting my customer? A: You need to be polite, but DO point out your payment terms as agreed when setting the account up with your customer. Stress to them the consequences of not paying, such as adding a late payment fee, interest or passing it to a collection agent. You can also mention that it may effect their credit rating. Q: Can I add late payment charges? A: Yes under the Late Payment of Commercial Debts (Interest) Act 1998 you can add a late payment fee. The amount you’re allowed to charge depends on the amount of debt. Q. What can I do if payment remains unpaid? A: If payment remains unpaid then a 2nd reminder is necessary at 14 days overdue, which is worded strongly and re-iterating your terms and the consequences of not paying within 7 days of the letter. The consequences are stopping supply/service, cancellation of the credit account, court action or transfer to a debt collection agent and negative credit reporting. Q: Is there a time limit to chasing overdue debt? A: Yes under the Limitation Act of 1980. The Limitation Act says that the limitation period for simple contract debts is six years. Q: What other options do I have other than court action for collecting a debt? A: Offering a payment plan can have a very positive effect on collecting an overdue debt. In a lot of circumstances invoices remain unpaid because of a shortfall in cash flow. It maybe a temporary situation! If you know your customer well then you will be able to judge what the issue is, especially if you have not been told the reason for non-payment. Some people feel embarrassed to say they have cash flow problems. You can offer various time scales weekly or monthly, ask them what they can afford. Set the payment plan out in a formal letter. Send a reminder a couple of days before the instalment is due. You could also send a statutory demand for commercial debts over £750. 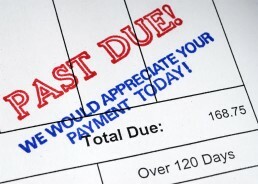 You will need to serve the demand, the debtor then has 21 days to pay the debt. If they don’t pay then you can issue winding up proceedings. This is quite costly to do. Q: Do I need a solicitor to submit court action for an overdue debt? A: You don’t need a solicitor to start court proceedings. You can file claims yourself on Money Claim Online. Sign up for an account, submit the claim and pay the court fee. There are FAQ’s, help topics, civil procedure rules and advice lines. Q: Will I need to attend court in order to collect the debt? A: There is a procedure, if you file a claim and your debtor files a defence and or counterclaim then quite possibly you may need to attend court. Although ideally you need to try and settle without attending court. You can do this through mediation using a court mediator. It is a very effective way of settling the dispute, if your willing to compromise. The mediation service is free and is used to try and prevent the courts time from being wasted. If mediation fails then both parties will need to attend court. Q: How long will court action take? If I win, will I receive full payment? Small claims usually take 6 to 8 months from the claim being submitted to attending court, although time scales vary. Be very confident that you have a strong case, because if you lose, you risk non payment and you may have to pay your debtors costs. If the debtor is struggling to pay the judge may agree to them paying you in instalments. Q: Who pays the court fees when submitting an action through the court for the collection of debt? A: The claimant pays the court fees if you are successful in your claim, then the court fees are refunded to you. Q: If I think a debtor is lying to the court, what can I do? A: Getting the debtor questioned by the court is something you can request if you feel it is necessary. You can do this by completing a N316 or N316a (application for order that debtor attend court for questioning.) Types of forms are dependent on whether it is an officer of the company or an individual. The forms are available from the HMRC. We hope you found this article “frequently asked questions about credit control” helpful, if you did please share it and if you would like some free, no obligation advice call us on 01494 422742.